Celebrating SG50 the Titansoft Way: Embrace Singlish! Do you know Titansoft is made up of Titaners from across 10 different countries all over the world? 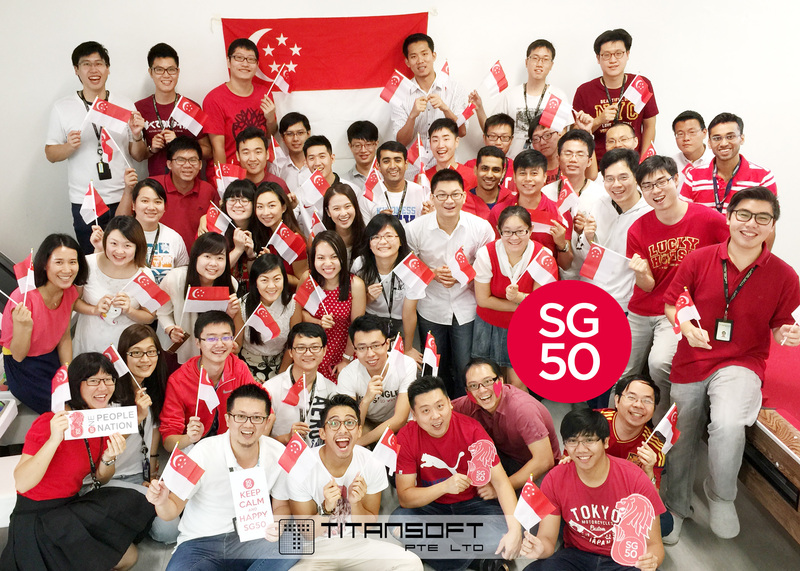 Today, over 40 Titaners from the Development departments gathered together for an early SG50 celebration. Just like the multi-cultural, multi-religious city we call home, Titansoft’s diverse workforce of all races and nationalities come together as one, building friendships across borders. We can’t wait for the Jubilee Weekend (7-10 Aug) to come already! If you are still out of ideas for creative ways to spend the weekend, check out SG50’s event calendar! While there are lots of events going on during the national celebration, I’m especially thrilled to hear about the first of Google’s Shophouse located at Spottiswoode Park Road (cool that it happens to be really near Titansoft’s office too!) Besides unveiling technologies behind Street View, you can get an early sneak preview of the new 360-degree panoramic views from across Singapore, try out the Google Cardboard and experience lots more. The Google’s Shophouse is located at 63 Spottiswoode Park Road, and will be open to the public on August 1-2 and August 7-10 anytime between 10am – 5pm. As part of SG50 celebrations here at Titansoft, let’s come together to embrace the true Singaporean spirit and have a go at some Singlish! A hillbilly, someone with little dress sense. Also used to refer to a gangster. “阿明” in Chinese. An extension of “steady”, this is an adjective describing someone’s prowess or ability to remain cool under pressure. A person with a nervous disposition, one who is easily flustered. Literally blur like a squid. To be extremely clueless. Squids squirt ink as a self-defence mechanism to get away. The ink makes it hard to see, thus “blur”. One who is nosy or prying; one who meddles in others’ affairs; a nosy-parker. “雞婆” in Chinese. This entry was posted in Titansoft Culture and tagged SG50, Titansoft Culture on July 31, 2015 by Lorraine Lai.